Not too long ago in early April 2017, we visited 8 villages on the boat along the Irrawaddy River and found that each village have a currency of their own other than “Kyats,” official Currency in Myanmar. In Myay Zun Village, a village by the river bank, as we walked around the village main road, we saw some grandmas and aunties holding a basket of peanuts and walking towards the vehicle parked on the roadside. Inside the vehicle, a gentleman was sitting inside as he was making announcement saying that they were accepting donations for the monastery. And the grandmas and aunties were pouring down their peanuts into the large bag on the vehicle. I asked politely and got to know that those baskets of peanuts were the offerings for the monastery instead of money. Here at the villages along the river, villagers grow peanuts every year from November and harvested after 100 days. Peanuts are the main income source of the village and therefore in a way peanuts are used to measure the values of every goods and services as well as for donation. I think Irrawaddy River can tell a lot more about the real Burma than any modern cities such as Yangon and Mandalay or tourist cities such as Nyaung Shwe and Bagan. 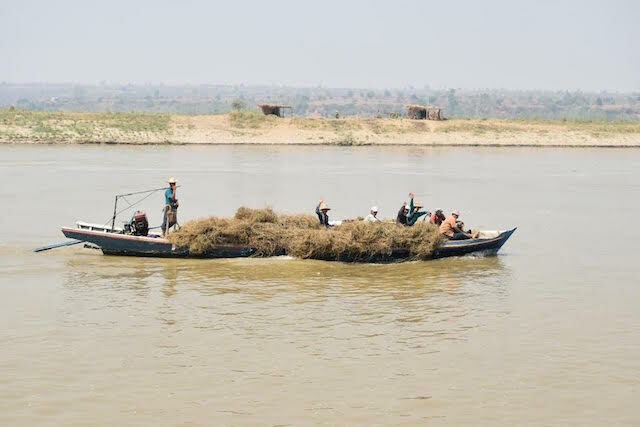 Rent a boat along the river and get on it for exciting adventures to be able to appreciate and to truly live as a Burmese for a few days during your visit to Myanmar.